One of the S. Lake maps with Single Track Trails. The Lake Tahoe Bicycle Coalition (LTBC) recently released the latest Bikeway Map updates for Lake Tahoe. LTBC produced the free maps that are available online and at various businesses throughout the Tahoe region. The maps are easy to read and provide useful information about trail access, picnic areas, hiking, bathroom locations, and more. Planning a family cycling adventure has never been easier. My review of the maps indicates a very complete listing of paved bikeways and bike routes around the lake and over to Truckee. The Tahoe Rim Trail is also shown, with many of the popular single track mountain bike trails out of Tahoe City, Incline Village, and South Lake Tahoe. 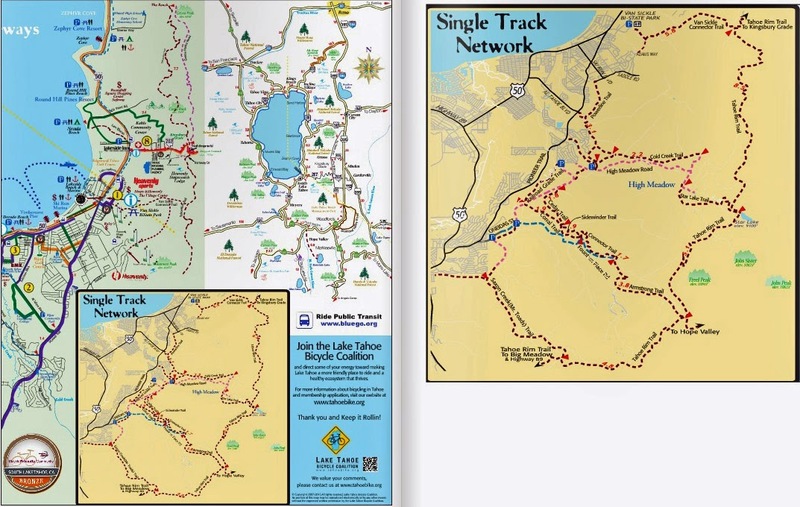 Download the Bikeway Maps on the Lake Tahoe BicycleCoalition website. LTBC is committed to making the Lake Tahoe Region a safe, fun and diverse area for all modes of cycling: Road bike, BMX, Cruiser, Mountain bike, and electric. You can become a member or volunteer for this non-profit cycling organization.